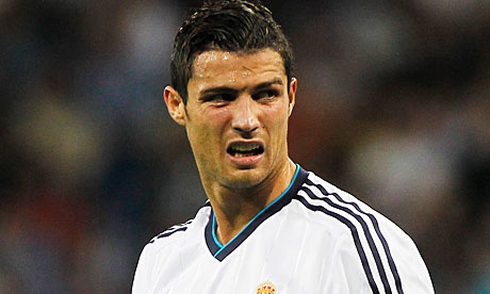 Sometimes, Cristiano Ronaldo appears to be as unpredictable off the field as when he is when inside a football pitch. After leading Real Madrid to victory last Sunday night, with his two first goals in this season's La Liga, Ronaldo granted a few statements after the game, where he took everyone by surprise, by revealing to be unhappy at Real Madrid. The Portuguese star didn't give many clues on the reasons behind his dissatisfaction, but media from all around the world didn't wait too long to start speculating. An enigmatic Ronaldo came off from Real Madrid's locker room this Sunday night, right after the Merengues earned their first victory for the Spanish League on this season campaign. The Portuguese superstar decided to open up his feelings in the post-match press area, revealing to the journalists that he's currently sad in Real Madrid, but not pointing many clues that may help people understand the reasons behind it. 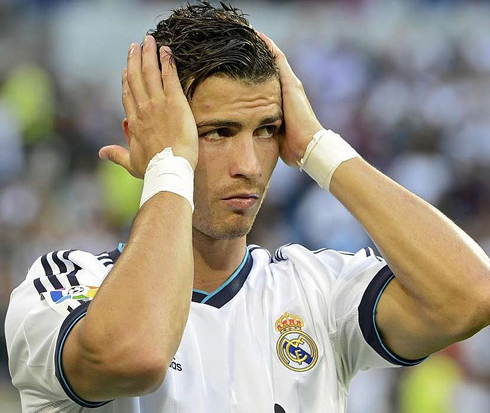 As expected, these statements surprised half world and the media immediatly started speculating about all the possible scenarios that could justify this momentaneous and surprising sadness from Cristiano Ronaldo. Several players and celebrities have already commented on the issue, but the truth is that everyone is trying to guess what's in Ronaldo's mind and all the information that has been put out over the last days is just part of the speculation that keeps beind feed by journalists. Later this Tuesday, Ronaldo granted another round of statements, this time to clarify that his unhappiness has nothing to do with money or demands for a new contract, one of the theories that several newspapers had chosen to pick as the main reason for this imbroglio. Below, we'll be discussing a few of the theories that have been raised over the course of this week. Journalist: Why didn't you celebrate tonight's goals against Granada? 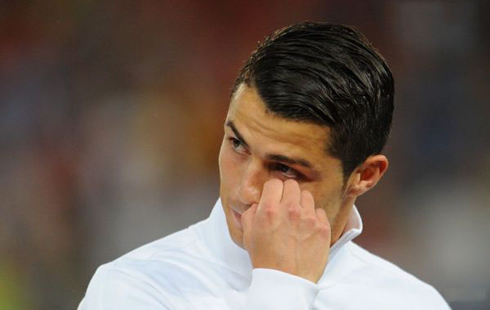 Cristiano Ronaldo: "Perhaps I'm a bit sad. The only reason that can explain why I'm not celebrating goals is that I'm not very happy...", started by announcing the Real Madrid forward. Journalist: Why are you sad? 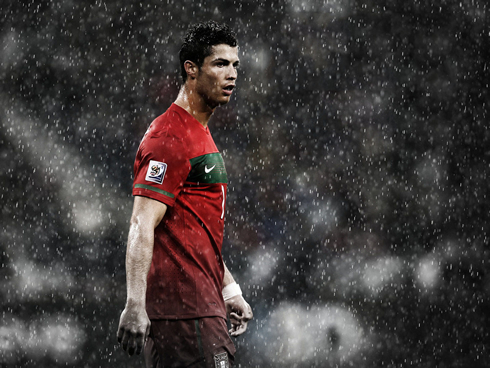 Cristiano Ronaldo: "Some people know why..."
Cristiano Ronaldo: "No, it's not because of that. That's the less of my worries. This is about something a lot more important than that", continued replying the Portuguese star, without giving much clues on the true reasons for his sadness. Journalist: Is it something related to Real Madrid? 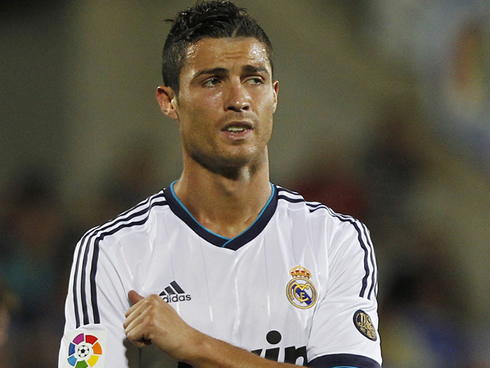 Cristiano Ronaldo: "I'm not going to speak more about this. People know the motives that led to this situation..."
Journalist: Is it related to your current form at the club? Cristiano Ronaldo: "I got 4 goals in the last 5 matches, so it's definitely not that as well." Journalist: Does this have something to do with any personal or professional reasons? Cristiano Ronaldo: "Professional reasons. People inside the club know the reasons why I am unhappy..."
Following these surprising revelations, one could anticipate how the media were about to approach this incident and the amount of theories and speculation that was going to be created in the following days. We'll be outlining some of those possible explanations, even though several of them lack any kind of credibility or consistency. More important than anything else though, is to realize that Ronaldo knows what he is doing and he certainly predicted that this speculation towards his statements would generate this much controversy and talking all around the World. The Portuguese player intentionally triggered this wave of attention for some misterious reason that few people know by now. 3rd hypothesis: The feeling of a lack of support from Real Madrid, towards his desire of winning the "FIFA Balon d'Or" next January, that became more proeminent after watching Iniesta winning the "UEFA Best Player in Europe 2011/12" trophy last week. 4th hypothesis: An allegged conflict with other Real Madrid players, such as Casillas, Marcelo or Xabi Alonso. 5th hypothesis: The club not having respected Ronaldo's intention of not playing against Granada, due to the fact that his father deceased roughly 7 years ago (6th of September, 2005). 6th hypothesis: Real Madrid not having supported and clearly defended Fábio Coentrão (one of Ronaldo's best friends in football), after the left-back got sanctioned with a 4-match ban for supposedly insulting the referee on Real Madrid's league match against Getafe, on the 26th of August 2012. The club filed an appeal, but nothing more than that. What has been presented to us as one of the strongest theories for Ronaldo's recent problems in Real Madrid, concerned precisely his contract with the club. The Portuguese ace signed a 6-year contract with Real Madrid back in 2009, which means that there are still 3 years left remaining for it to expire (June 2015). 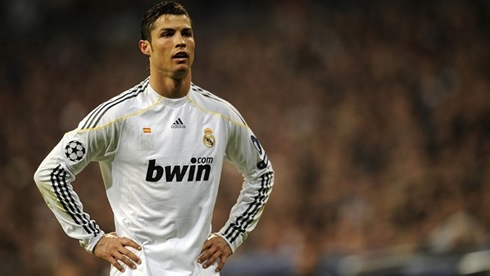 However and as time passed, not only Ronaldo has fallen into being only the 10th best paid footballer in the World, but he is also expected to start paying a bigger tax slice after he completes his 5th year residing in Spain. This has to do with the fact that under the "Beckham law", Cristiano Ronaldo has been granted with a 5-year period where he's allowed to pay only a 24% tax fee over his income, while after that period (starting in June 2014), the Spanish Government will start demanding him for a 44% tax fee. 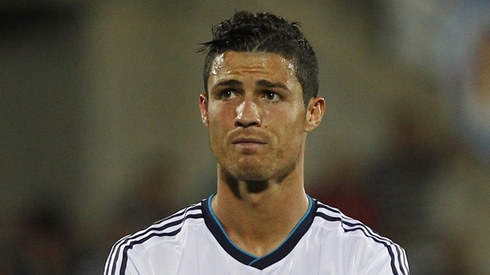 Cristiano Ronaldo: "The fact that I am sad and have expressed this feeling, seems to have led to a lot of talking. I've been accused of doing this because I want more money, but hopefully one day, everyone will realize this isn't the case. At this stage, I just want to assure to all Real Madrid fans that my motivation, dedication, commitment and desire to win all competitions remains intact. I have too much respect for myself and for Real Madrid as an institution, to not give everything I have on every match. Best regards to all the Madridistas! ", posted Ronaldo, earlier today on his social network personal pages. With the 1st hypothesis appearently ruled out by Ronaldo himself, we can move on to the 2nd one. Real Madrid former player, Guti, has actually been one of the celebrities who most criticized the way how Merengues have acted during this Summer's transfer season. Getting rid of Granero, Nuri Sahin (on loan) and Lass Diarra and bringing in Modric and Michael Essien as their replacements, is far from a scenario that doesn't generate controversy. The right-back spot remains being Real Madrid's biggest "Achilles heel", while in the other hand, players like Kaká or Ricardo Carvalho will remain in the team, even though they seem to have lost their space on the squad. One could also wonder if Ronaldo's unhappiness can have anything to do with the way the club showed the exit door to Granero or Nuri Sahin for example, or simply if it has to do with the fact that Real Madrid didn't bring any player that Ronaldo may have recommended before the transfer deadline expired (maybe a new partner for the attack? or a more consistent right-back?). Even though this doesn't seem to be a very likely scenario, there's surely room for speculation to be made on this topic. Could Ronaldo be feeling that Real Madrid is not doing all possible efforts to promote his image and with that help him raising the support he needs to collect the necessary votes to win the FIFA Balon d'Or? Just to remember everyone, this award distinguishes the "Best Player in the World" and it comes from the result of a voting poll among coaches, captains of international teams, as well as journalists from all around the World. The logical question we can raise on this, is if Real Madrid could in fact do something on this regard, that would eventually lead that more coaches, journalists and journalists end up voting on Ronaldo, next January. 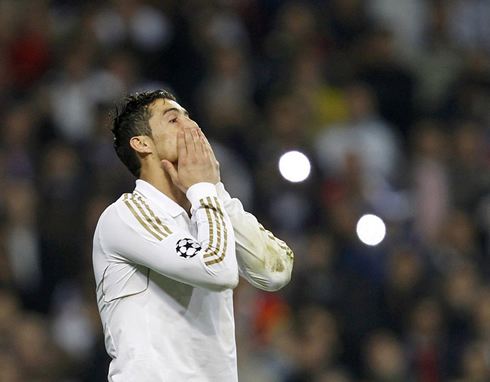 Is the Portuguese star expecting that Real Madrid directors praise him more often? With the "UEFA Best Player in Europe" awarded last week to Andrés Iniesta, Ronaldo probably felt some sort of an anticipated frustration to what may be coming in his direction on January, precisely the month when the FIFA Balon d'Or gala and ceremony is to take place. Both former legendary players, Paulo Futre and Roberto Carlos, have expressed their view on this hot topic and the two seem to agree that this appears to be the strongest motivation behind this recent Ronaldo burst. Even though the Portuguese captain has repeatedly said in the past that this individual award is far less important than the titles he'll be trying to win with Real Madrid this season, we all know it still means a lot to him. However, I can't see as a plausible reason for Ronaldo to get sad at Real Madrid, the fact that the club doesn't engage into some sort of "Ronaldo praising campaign", which would potentially help him receiving more votes when the right time comes. Is Ronaldo being too harsh with Real Madrid or is this another theory that ends up being far from what's really happening? This hasn't been the first time that several media suggested that Cristiano Ronaldo may have had some relationship problems with other Real Madrid players. A lot has been said about the status of his friendshipness with the likes of Iker Casillas, Xabi Alonso or Sergio Ramos for example, but this time, the name of Marcelo has also been put on the list. The Portuguese and the Brazilian have been great friends ever since Ronaldo joined the club in 2009, but over the last days, the media have been attempting to support the idea that their relationship deteriorated, especially after Marcelo suggested Iker Casillas as a potential FIFA Balon d'Or winner. The truth is that we've seen Marcelo running towards Cristiano Ronaldo's direction in order to hug him and congratulate him for another goal this last Sunday, when Real Madrid took the lead in their game against Granada. Even if this was to be the case, it wouldn't make much sense for it to single-handedly to cause such a reaction in Ronaldo. This is one of those speculations that are actually very easy to rule out, as most of the media out there don't even seem to have picked the right facts. Cristiano Ronaldo's father, José Diniz Aveiro, deceased on the 6th of September, 2005. This Thursday will mark precisely the 7th year since he passed away, so it wouldn't have made much sense that Ronaldo had asked anyone at Real Madrid to be sidelined in the game against Granada (2nd of September). If such a request from Ronaldo was ever to happen, one would expect it to take place already in the Portuguese National Team, since the date of the game against Luxembourg (7th of September), is actually a lot closer to the day where his father, José Diniz Aveiro, passed away (06-09-2005). 6th hypothesis: The Fábio Coentrão "dossier"
Cristiano Ronaldo and Fábio Coentrão have been very close friends since the left-back defender arrived at Real Madrid in 2011. Seen as the "ugly duckling" in the club ever since he landed in Madrid (probably because of the 30 million of euros price tag from his transfer, that sent him from Benfica to Real Madrid), Fábio Coentrão has certainly been struggling to win the affection from the Madridismo, since day one. On the 26th August, Real Madrid visited Getafe for the 2nd fixture in La Liga, a game that the Merengues ended losing by 2-1. Near the end of the game, Fábio Coentrão has allegedly insulted the referee from the Real Madrid bench and got immediatly sent off with a direct red card. A few days later, the Spanish Federation Disciplinary committee extended the Portuguese left-back suspension into a 4-match ban and Real Madrid filed an appeal, which ended up being rejected. However and despite the club's appeal, there weren't many external signs from someone connected to Real Madrid expressing their wrath against such decision and it's possible that Ronaldo may have asked for a stronger intervention. Just like any other of the hypothesis raised on this article, this is just another one being added to the speculation list and until Ronaldo discloses the real reason behind his sadness, everyone will keep firing guesses in the dark. Real Madrid teammates Arbeloa, Kaká, Higuaín and Xabi Alonso have also recently spoken about this Ronaldo incident, with the first two saying that the Portuguese star will receive all the support he needs from the club, fans and his teammates. As for Xabi Alonso and Higuaín, the Spanish midfielder and the Argentinian forward tried to round the issue and said that they know nothing about it. Xabi even joked a bit and said that he surely isn't sad at all and that everyone has their own personality. 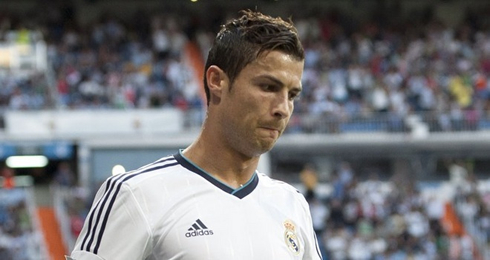 As for Higuaín, he assured that Ronaldo didn't give any prior signs of being sad over the last weeks. A good proof that these Ronaldo statements are having an impact in the entire football scene is that even Lionel Messi felt forced to answer a few questions on this matter, replying with the following words: "Whenever Ronaldo speaks, you don't have to ask me questions at all and the same happens when the opposite occurs. I have nothing to do with that! 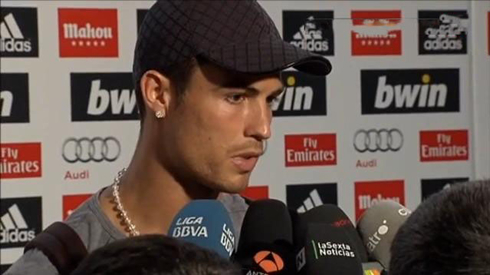 ", replied the Argentinian forward, clearly bothered with the journalists for asking him questions about Ronaldo. The only person besides Ronaldo who is surely more likely to have some reliable knowledge on what's really going on, is Jorge Mendes, precisely Cristiano Ronaldo's agent. The Portuguese FIFA agent also felt the need to speak out, as he preferred to allow Ronaldo to keep the mistery behind this, for as long as the Portuguese player wants. Jorge Mendes: "In regard to several news from the media that implied that I got surprised and upset with my player, Cristiano Ronaldo, recent statements, I would like to clarify the following: What Ronaldo has said last Sunday night is based on reasons which I am fully aware of, but that will only be revealed if he ever decides to do so and whenever he feels it's the best timing for it", announced Jorge Mendes from his agency website, Gestifute. Hopefully, Ronaldo will end up revealing what has been tormenting him lately and everything will be restored to normal in Real Madrid. Cristiano Ronaldo has now joined his Portuguese teammates, as they will start the qualification stage round for the 2014 World Cup, to be held Brazil. This Friday (07-09-2012), you can watch Luxembourg vs Portugal, Holland vs Turkey, Moldavia vs England and Brazil vs South Africa, all matches provided from our football live streams section.